Kick play time up a notch with this deluxe gym featuring five light-up piano keys, a repositionable toy arch, and four musical settings that keep your little one rocking out for years. As your baby grows from lay and play to tummy time to sitting up at the piano, you can change up the music and learning, too. Smart Stages technology lets you change the learning content to best fit your baby's age and stage, while real piano notes encourage your little Mozart to create a tune of their own. You can even detach the keyboard for musical fun on the go. To give your child the best possible start in life, you don’t have to have all the answers or do things a certain way. All you have to do is the best you can, and let your kids play. At Fisher-Price, we’re dedicated to helping you do just that by working tirelessly to bring you the very best gear and toys. Fisher-Price toys are made to help all kids-from infants to toddlers to preschoolers-develop through play, in their own ways, because that’s how they learn best at each age and stage. And for babies, our gear offers simple solutions (more sleep, anyone?) you can’t possibly parent without. Gross Motor: With all that kicking, reaching, and pushing up, those little muscles are getting ready for big things. This musical gym is the perfect play time spot for your growing mini-Mozart. The large and colorful play mat and repositionable toy bar with five activity toys take baby from laying and playing to sitting and interacting.Keep the learning and music fun going and growing with the removable light-up piano, which includes three Smart Stages levels and one bonus freestyle piano play mode-time to rock, baby. 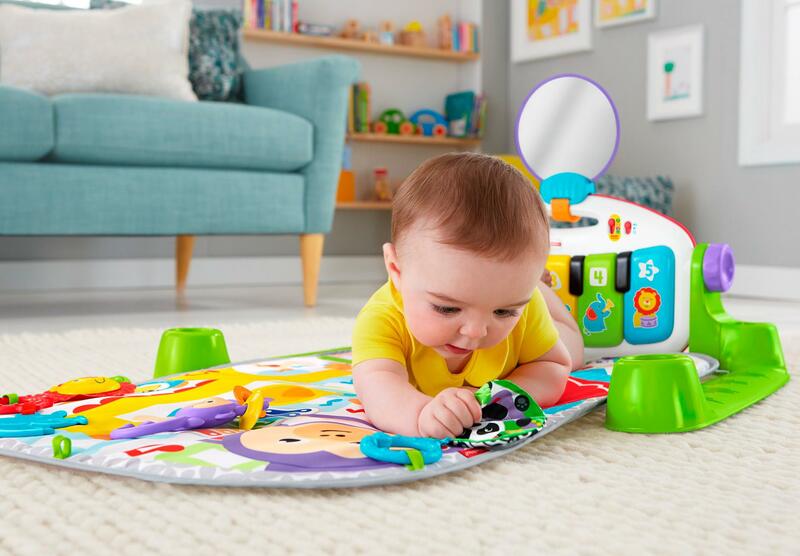 With Smart Stages technology, the learning fun can keep going as your baby keeps growing. Each level is filled with different songs, sounds, tunes, and phrases for your mini music lover to explore. Level 1: Sense – Teeny-tiny ones can enjoy up to 20 minutes of continuous playful music, lights, and sounds to engage and stimulate their senses. Level 2: Discover – Learning animals and the sounds they make, along with short instrumental tunes, is worth sitting up for in this level. Level 3: Explore – Playful songs and phrases introduce your little mover and shaker to colors, shapes, and numbers.